The DfE headline measures were released this week and they confirm that BHASVIC is one of the best performing providers nationally. BHASVIC is in the unique position of being the only college to feature in the top 10 Sixth Form Colleges nationally for both the actual results gained and the progress that students have made whilst here. We also appear in the top 10% of state providers for both A level points score and A level progress score – there aren’t many institutions who can claim this status – which is all the more remarkable considering that BHASVIC provides the 5th largest A level cohort in the country. Our A level points score at 37.51 places BHASVIC as the second best college nationally out of 350 providers, behind only Hills Road College, Cambridge. Compared to all state providers of A levels BHASVIC comes 175th out of 3,685 institutions (top 5%). Our A level Progress score (+0.20) means we are enabling our students, on average, to achieve one fifth of a grade higher than expected. This places BHASVIC as the 8th best Sixth Form College nationally and in the top 10% of all state providers. The Applied General (BTECs) progress score (0.48) is also very strong - we are enabling our students to achieve, on average, half a grade higher than expected resulting in the average BTEC grade at BHASVIC rising to Distinction* Minus this year. We add about one-sixth of a grade on average to A level results for Disadvantaged students. The Average Point Score for Disadvantaged students at BHASVIC is 33.65 (C+) which betters the national average of 31.78. However, we remain passionate about narrowing the attainment gap between all BHASVIC students and Disadvantaged BHASVIC students and there is still work to be done here. 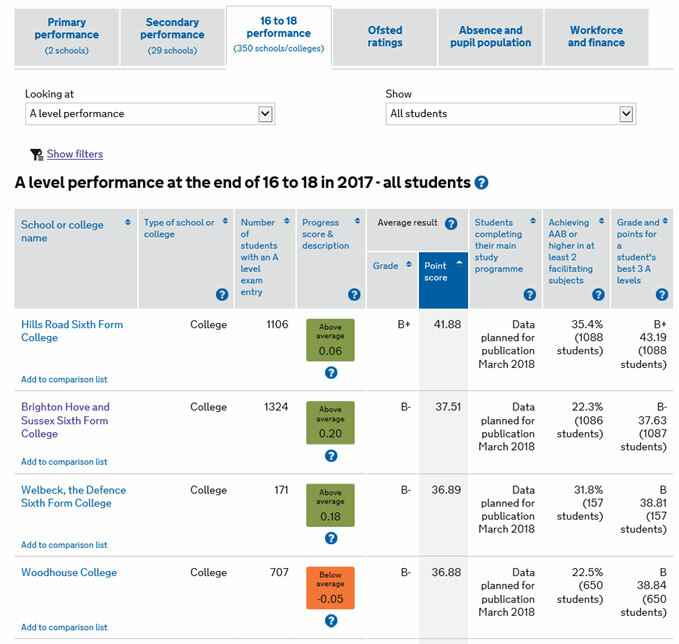 Principal William Baldwin said ‘It is testament to the hard work of our students and staff that BHASVIC has such a strong position in the national performance tables yet again. It is especially pleasing that we stand up to and even outperform some selective institutions, when you consider that we are a non-selective, open-access college. It is important to note that colleges are about so much more than results and performance tables. The wonderful community that we have here, the focus on learning how to learn, individual personal development, opportunities for enrichment and so on don’t appear in these tables and to me, these are more important indicators of the health of a college’.